Spring has gone careening into summer here in NYC. The temperature as I write this is 88 degrees while the normal average high is only 65. That means things are blooming like crazy all over town. The Brooklyn Botanic Garden's cherry tree festival planned for this weekend is reportedly ahead of schedule according to their Cherrywatch map. It must look something like this time-lapse film from 2008. 2008 Cherry Blossom Time-lapse at Brooklyn Botanic Garden from Brooklyn Botanic Garden on Vimeo. "This time-lapse was created by Dave Allen, BBG's Web Manager, from over 3,000 digital photos, one taken every 3 minutes from April 18 to April 26, 2008, of Brooklyn Botanic Garden's famed Cherry Walk." 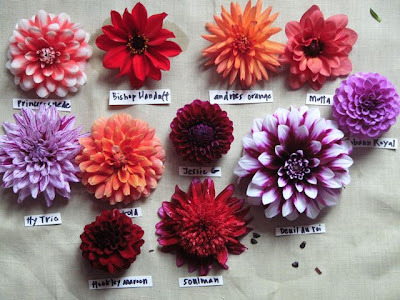 Recently I wrote about dahlias in my Q&A for The New York Times. I like to call on outside experts in these little columns not just because I don't know everything (which is a big reason) but also because I think it adds another layer to hear from another person and learn more about their interests. For this particular week's special guest I had to look no further than my friend Frances Palmer. 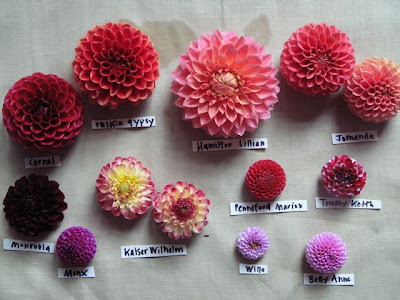 Frances is a very talented potter who lives in Connecticut and grows about 80 varieties of dahlias in her cutting garden. 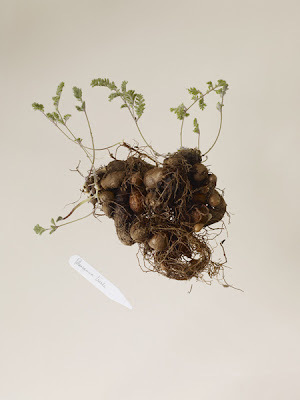 Even though the column came out a few weeks ago, I wanted to show you some images of Frances's collection and also a sneak peek at the tubers that she overwinters in the basement of her barn. 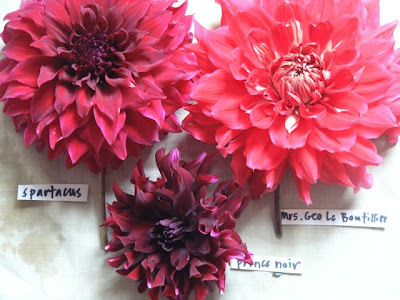 I plan to pay a visit to Frances this summer and show you this year's dahlia collection. 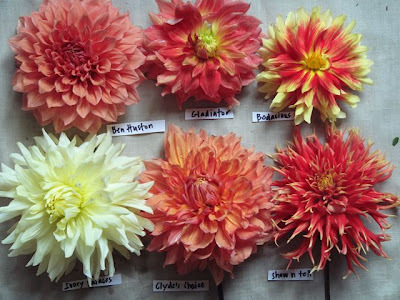 She photographed these headshots of her dahlias in full bloom to keep track of her favorites from year to year. She especially likes the huge, 12-14 inch wide dinner-plate dahlias (above). In past years, snooty types used to look down their noses at these gargantuas but Frances makes them seem fashionable again—especially when you see them displayed in her beautiful vases. See her website here. 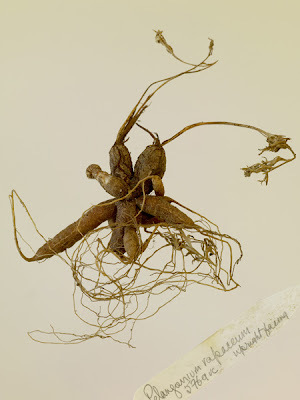 These huge tubers are several years old and produce towering dahlia plants seven or eight feet high. 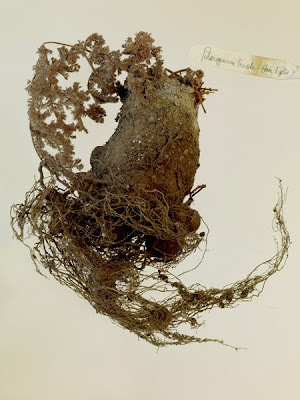 They are packed for a winter's nap in sawdust, peat moss, and shredded paper so that they don't rot. Frances's cutting garden in its bare pre-planted state a few weeks ago. I'll show you this space in all its summer glory in a few months. 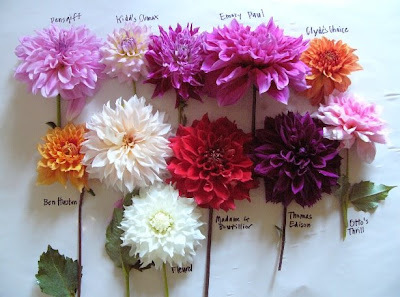 Read the full New York Times Q&A: Don't Plant Dahlias Too Early here. Hello. I've returned from vacation. More posts to come soon. 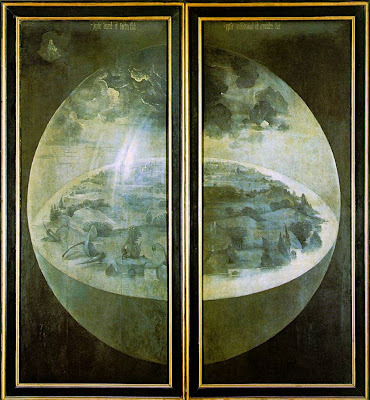 I will be away from this blog for a little bit. I hope to be posting while I am away but it will probably be on a more sporadic basis for a number of days. I hope to lure you back with fresh posts when I return. It may rain again tomorrow so do yourself a favor and buy the whole album in its wonderful entirety here. After leaving the Orchid Show at the New York Botanical Garden a bit overheated last week, I decided to recalibrate back to the correct season with a walk on the grounds and a check-in on the coming of spring. The weather was wet and cold, the sky was dark, but I managed to find these first signs that the season might finally change. Spring seems especially timid and hesitant about arriving this year. Fickle thing, perhaps she's heard that things aren't going so well around here and has decided to prolong her vacation down south. 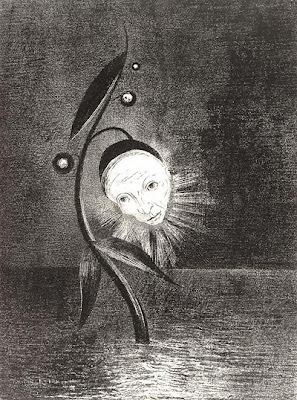 But she has to come along sometime, and the longer she waits the more resentful we're getting. So spring, if you're reading this...just do it already. A beautiful tree, Prunus mume 'Peggy Clarke', aka Chinese plum or Japanese apricot depending on which side of the East China Sea you're from. The Lady's Walk at the New York Botanical Garden. Nearest to farthest, pink Viburnum x bodnantense, yellow Edgeworthia and Prunus mume. Viburnum x bodnantense 'Dawn' has a spicy scent that seems unexpectedly tropical. 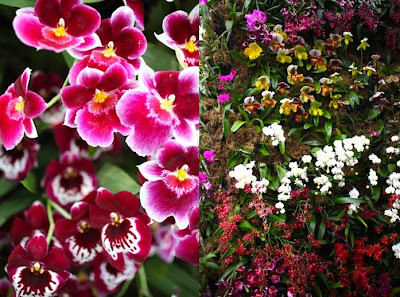 As the photos of my recent visit reveal, every inch of Brazilian Modern, The New York Botanical Garden's 7th annual Orchid Show seems to be festooned (yes that's the right word) every inch is festooned with orchids blooming at full volume. 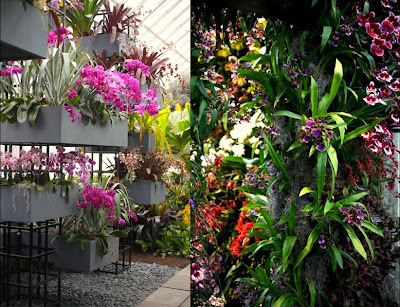 There are walls of orchids, towers of orchids and dangling chandeliers of orchids, each inspired by the gardens of the late Brazilian designer, Roberto Burle Marx. 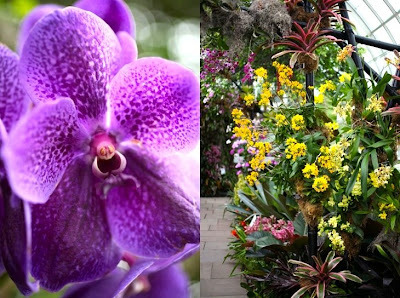 His distinctive style has been translated for the show by the Miami garden designer, Raymond Jungles and expertly installed and tended by Francisca Coelho, the curator of the glasshouses at the NYBG. The show is only up until April 12th so don't miss your opportunity to see all this vivid tropicalismo in person. 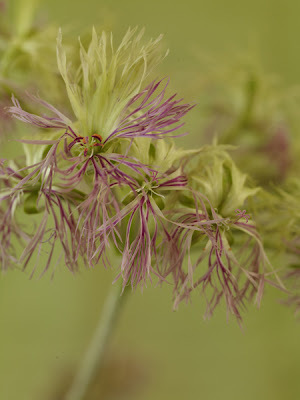 The Garden Conservancy's 2009 Open Days Program begins this weekend. Don't miss an opportunity to get behind the fences and walls of some of America's most inspirational private gardens on selected dates throughout the summer. As things really get rolling May-July you can check the 2009 schedule on the The Garden Conservancy's website to find what gardens are open specific weekends in your area. 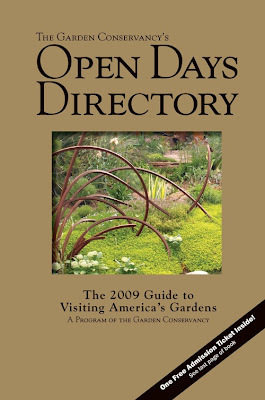 For navigational ease when you're driving from garden to garden, you'll need the Open Days program in book form available here. 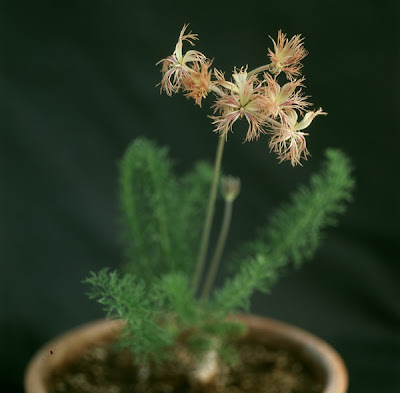 In these days of broad general appeal, it's so nice that there are still people out there like Robin Parer and her Marin County nursery Geraniaceae. 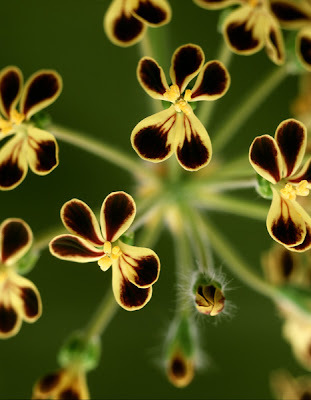 There she grows and sells only members of the plant family from which her business takes its name. 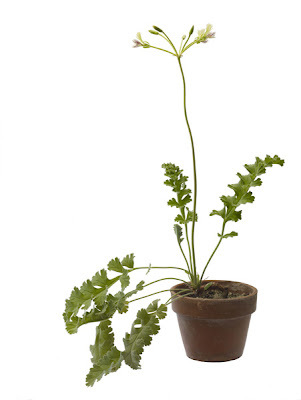 Robin has been selling these plants since 1983. 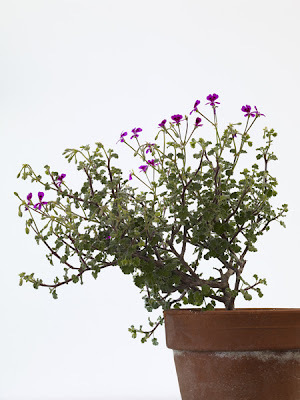 Now you may know that what we ordinarily call geraniums, the bright red things that spill out of Swiss balconies, actually exist in the genus Pelargonium. 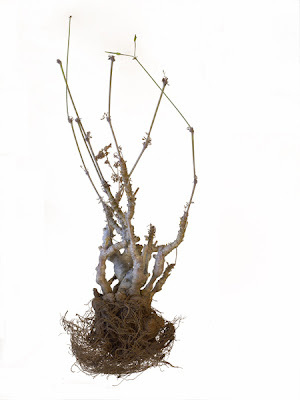 Robin sticks to the more outré members of the pelargonium set: the night-scented, the summer-dormant, and those, as you can see here, that produce massive bulbous roots. 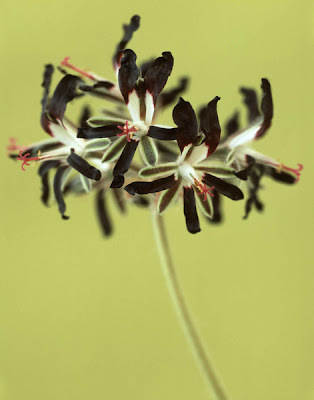 As an art project, the wonderful Bay Area photographer of gardens Marion Brenner has been photographing these "pellies" in all their weird glory at Robin's nursery. 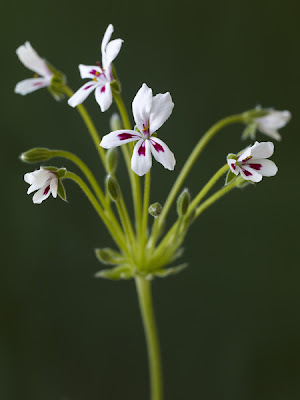 The shots here show differing species of pelargoniums in full, intricate bloom like you've never seen in the common bedding variety. 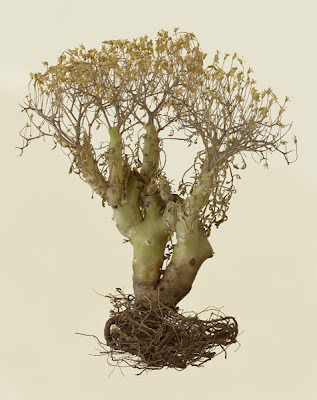 Others are captured dry and dusty in their dormant state. 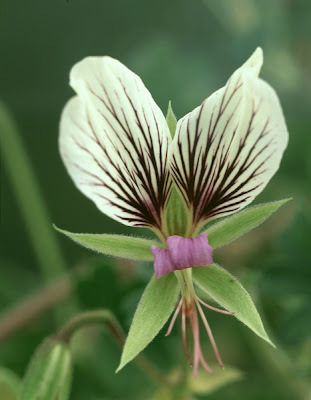 All are beautiful in Marion's expert lens. I certainly admire people who are specific in what they like. 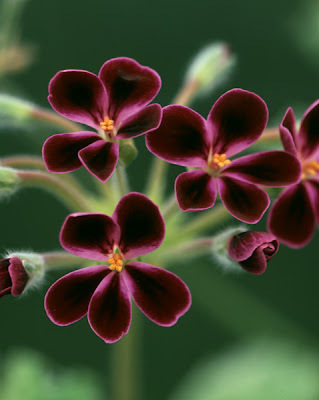 Robin doesn't only sell pelargoniums , including the scented-leaved varieties, but she also offers other members of the Geraniaceae family: the rarer erodiums, and the bone-fide geraniums which are hardy and very garden-worthy. Go to her website to see her stock. 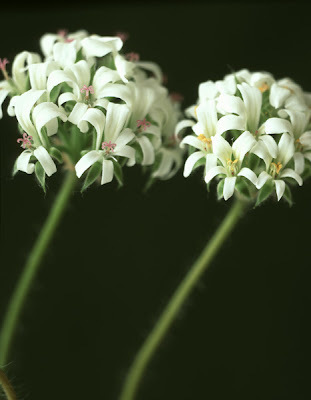 The New American Herbal (Clarkson Potter/Random House) is available at Barnes and Noble, Amazon, and indiebound. Visit my author's page here. Tomorrow's Garden (Rodale) is available at Amazon, Barnes and Noble, and indiebound. All visual content featured on this website is copyrighted to its respective rightful owner. No infringement intended. Images and screen captures are believed to be posted within rights according to the U.S. Copyright Fair Use Act (title 17, U.S. Code.). Whatweretheskieslike.com is purely personal, unofficial & does not have any relations with any of the people or products featured. If you own rights to any of the images and do not wish them to appear on this site, please contact us and they will be promptly removed. Copyright © 2014 All written and visual content by Stephen Orr/whatweretheskieslike.com is licensed under a Creative Commons Attribution-Noncommercial-No Derivative Works 3.0 United States License.